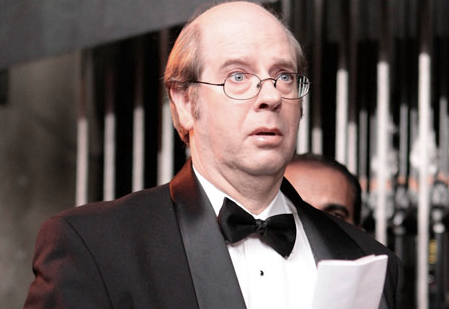 Are you a subscriber to The Tobolowsky Files? The podcast, a project of actor Stephen Tobolowsky-the youngs will know him as Sandy Ryerson on “Glee” and from “Heroes” and the olds will know him from films as diverse as Groundhog Day, Thelma and Louise and Basic Instinct-with David Chen at Slashfilm, just put out its 38th episode. Writing here, he previously discussed Memento and the thrill of trying out for characters named “Masochistic Gay Man”-today he writes about the adventures of time and the waiting room. I got an audition with one day’s notice for “Californication,” a comedy on Showtime staring David Duchovny. There was no script to read, just two scenes. I bridled at the idea on not having a clue as to what this character was, but I realized the only weapon I would have is to learn my lines. I got to the casting office the next day and I saw that every older leading man in town had read for this part. It was the â€˜gambler’s tell’ that no one my age was working. At first I was overwhelmed at the amount of competition and then I focused on the men that were actually sitting in the room waiting to go in. I knew them all. None of them remembered me. There was John Getz, Daniel Benzali and Peter Strauss. At one moment I was thinking about the scenes and my lines and now I was sideswiped by memories. John Getz was at least tangentially involved with the first time I ever got fired. It was 1984. I had auditioned for a show called “Maggie Briggs” starring Suzanne Pleshette. John was the leading man. I was visiting Mom and Dad in Dallas when my agent called and told me I got the part. It was my first recurring role. I would be getting $1500 a week to play the religion editor for a news staff. We celebrated when I heard the news. I had been doing children’s theater in the schools with 12th Night Repertory and had a couple small parts on television-until now. This was the first money job I had ever gotten. I had to leave Dallas the next day and get back for rehearsals. I felt like my dream of being a professional actor had been validated right before my parents’ eyes. That was a big deal as many of you can imagine. I got back to “Maggie Briggs” on the day of the network run-through. I rehearsed that morning with the scenes that I had auditioned with. Everything went smoothly. Then the writers wrote an extra speech for me. It was very funny in a completely nerdish way. We rehearsed the scene with the new speech once before the network people came in. About twenty or so executives came to watch a full rehearsal and evaluate where we were. We started the show from the top. I was in the third scene. Everything was going well until we got to where my new speech had been inserted. I opened my mouth to begin my new funny stuff and John Getz forgot the re-write. He cut me off mid sentence and jumped ahead with the old version of the scene. I stood there looking like I had no idea what I was doing and had made a giant blunder. Later that day my agent called and told me I was fired. I was crushed. The producers called and said that they were sorry; it was a network decision. They said since I was under contract for this one show if I wanted to get paid, I could stay on-as an extra. They understood that this could be embarrassing for me and they would let me out of my contract. I wouldn’t get paid, but I wouldn’t have to deal with the indignities of facing the rest of the cast and watch someone else play my part. I said, “Pay me. I’ll be an extra.” I made my $1500 that week. John never said a word to me about skipping over my part during the run through. That was 26 years ago. He was now sitting across from me in the “Californication” waiting room. Pacing around the room was Daniel Benzali. Here was a happy story. Daniel was the actor originally cast as the power mad Colonel in the sci-fi television movie “Night Visitors” shot in Canada (which I go into in great detail in my story “A Wager with Freddy”). Yes, it was Daniel who was cast to play the lunatic who had to get the alien away from Faith Ford. But Daniel had a fit of good judgment and dropped out of the show. As a Plan B, the producers called me. I gladly took the job. What was particularly funny was the makeup and costume departments never got the word. They still had Daniel’s 8×10 on the wall as the Colonel. They kept asking me what Steven Bochco was really like and how much they loved me on “Murder One.” I told them I was a different guy. They looked at his picture and then at me. True, we both were bald. I tried to point out that the name and the face were different. They could not understand what I was saying-that I was in fact a different human being than they thought I was. They stared at me as if I was suggesting a sort of “X-Files” transformation had occurred in the hotel. I told them they had been working in Vancouver too long. Peter Strauss was another story altogether. It was one of those episodes that seemed insignificant at the time but has stayed with me my entire life. It was 1981. I was in Buffalo acting in a play written by my girlfriend, Beth. We got an invitation to come into New York on a day off to see the opening of a play called “Einstein and the Polar Bear.” The play starred Peter Strauss and was directed by J Ranelli, who had previously directed “Crimes of the Heart” in Northern California. We came into the city and visited J at his apartment. Besides being a wonderful director, he also played the flute. He had a little pet bird that flew freely around the apartment and when J played-in fact, even when J started putting the flute together-the bird seemed absolutely delighted and perched on his shoulder and eventually stood boldly on the end of the instrument. J seemed very relaxed. He felt the show was in good shape and ready for opening. He started talking to us about life. He said one of the great advantages of being in your forties instead of your twenties is that you tend to take control of your space. You don’t let people push you around anymore. We went to the play and it was wonderful. I am not exaggerating when I say that the performance was interrupted with applause about two dozen times. Peter Strauss was absolutely heroic playing the J.D. Salinger-like author who had lost his faith in the world. The play ended with a standing ovation that seemed to go on forever. I was so happy for J and for the production. Beth and J and I went out to eat with Peter afterwards. Peter was charming and funny, telling stories. It was a great night in New York. On the way back to J’s, an overweight woman in tears came up to me and asked for $33.50, the price of a bus ticket to go to Baltimore to see her boyfriend. I gave her the money. Peter was laughing as to what a patsy I was, but we got into a spirited debate as to how she arrived at the exact figure of $33.50. We decided it was the inexactness of her story that gave it validity. The next day I rushed back to Buffalo and to my own inexact performance at the Studio Arena Theater. In the dressing room, putting on makeup before the show, I told my friend and fellow thespian, Bob, about “Einstein and the Polar Bear” and the evening with Peter Strauss and J Ranelli and the bird that sat on the flute. Bob looked at me hard for a second and tossed the New York Times he was reading in my direction. I looked at the paper and it was a review from the night before. The play, J, Peter, were destroyed by the review. There was no mention of the laughter or the applause or the standing ovations. I shook my head in disbelief. It made me wonder about J’s theory of the advantages of being forty, and how you are in control of your space and you don’t get pushed around anymore. In the waiting area, Peter Strauss had just finished his audition and was leaving the room. He was laughing and shook hands with the casting directors. He looked at me but nothing registered. The casting directors smiled pleasantly and said, “Stephen, we’re ready.” I nodded at Peter as he left. I guess he figured I was another “Rich Man, Poor Man” fan-an artifact from decades past. And I did. I told them about the night with Peter and how great he was in a wonderful play and how no one will know because of one horrible review. That night has haunted me for almost thirty years in that it demonstrated that you never know. And all the work and effort and passion you have-can be for nothing. The Tobolowsky Files is a project of Stephen Toboloswky and David Chen. You can subscribe through iTunes here or via RSS here. Or, you know, you can just e-mail Stephen at stephentobolowsky(AT)gmail(DOT)com.